Third and last quilt of the current commission. This one I decided to make a vase of flowers and I did end up using all the mom’s clothes without needing to add other fabrics. This piece has several three dimensional flowers. I even used a lined black eyelet skirt for the back on each piece and leftover pieces for the hanging sleeve. Final touch was personalized label with the woman’s picture on it. When the daughter saw the picture I emailed her, she told me she cried. I got goosebumps when she told me that! I did not know her mother, but almost felt as though she was channeling me. These three pieces went together so smoothly – without a hitch at all. I’m looking forward to the next three pieces and the challenge they will provide. While working on the first one, I decided that the second one would utilize the orange paisley pajama bottoms that were in the collection of clothes. The first piece was made entirely of the mom’s clothes, but the second piece I added some hand-dyed fabrics. Completed piece is below. As I thought about the piece my clients liked and then considered the clothing I had to work with, I decided to do the first piece in a very similar style to the piece they liked. Since there was a red t-shirt with a glitzy center, that became the focal flower. See step one below where I laid out the background using the blue jeans, khaki pants, the white jeans and some orange capris. I then quilted a design of leaves and vines. Then came step two – I interfaced the t-shirt and also fused it with Wonder-Under. Center of the flower came from a black t-shirt. Step three – added a couple more leaves and began the quilting. Quilting completed and piece is finished. A woman and her father came to me last summer requesting that I make some small art quilts out of their mother/wife’s clothing. She had passed away the previous year. They looked at my work and decided on a piece that they really liked, Black/White with Orange. We agreed that I would make three pieces, one for the daughter, one for the father and one for the mom’s best friend. When they dropped off the bag of clothing and that’s when I said to myself, “What have I gotten myself into?”Here’s a picture of the clothes – jeans, khakis, eyelet lace skirts, t-shirts with glitzy designs, and vests with lots of seams. This was going to really be a challenge! So stay tuned. I will share with you in a series of blog posts how I went about this project and the final results. Oh, by the way, much to my delight, the clients absolutely loved the final pieces! So here’s my idea of the perfect thread storage system. It’s a rolling tool chest usually used by carpenters to store their tools. I lined each of the drawers with vellux so the thread doesn’t roll around. Each of the shallow drawers holds decorative thread stored by color. 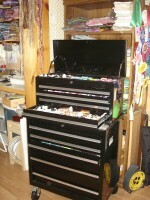 The deeper bottom drawers I use for yarns and other embellishments. The top section with the lift up lid I use for general sewing thread. This system sure beats having to open all those plastic boxes I used to use or storing on a peg board on the wall. I can roll this right next to me at the sewing machine when needed and then push it out of the way when I’m done.